Julia Allen is a waitress by day, painter by night, and…a famous 1800s authoress on weekends? 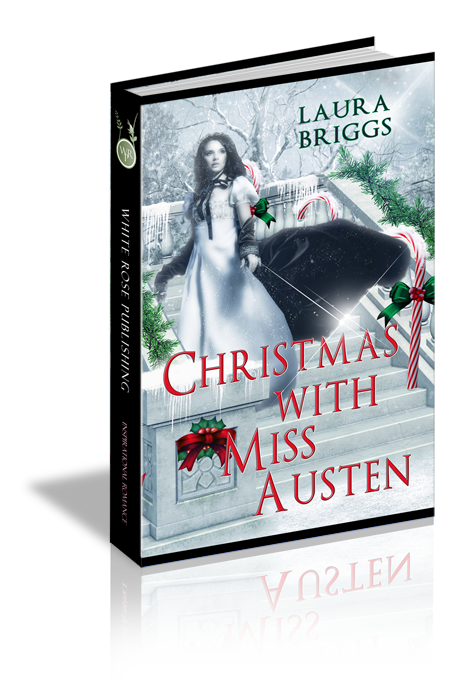 Moonlighting as Jane Austen for a historical open house is a strange hobby for a contemporary artist, but Julia loves the role–until she falls asleep and gets locked inside after all the visitors are gone! Rushing home from the dark, historical mansion, she collides with a stranger in the snowy park, and discovers later her shortcut cost her the rare copy of Austen’s Northanger Abbey borrowed from a friend’s treasured collection. Book historian Eliot Weston thinks he imagined the Regency-era figure, but the book he finds in her wake proves otherwise. The first edition of Jane Austen’s novel is authentic and incredibly rare, but he fails to find any trace of its owner. Reminders of the unusual encounter keep popping up, however, like the pretty modern artist eager to buy an identical volume. Coincidence? Or Divine intervention making it clear this is anything but an ordinary Christmas for these two hearts? The real Jane Austen never would have made this mistake. This was Julia Allen’s first thought as she opened her eyes to darkness, the only light the faint embers dying in the hearth. Sitting up, her book tumbled from her lap, landing on the threadbare antique carpet beneath her feet. A first edition of Northanger Abbey. It was not 1818, however, but the twenty-first century. And Julia Allen was not a Regency women’s author, but a volunteer at the historic Steventon House, property of the city of Delaford, Massachusetts. She must have fallen asleep waiting for the last few Sunday evening visitors to straggle out. The fellow volunteer who walked this floor before they turned out the lights missed her somehow. Which meant the building was now a series of dark, cold hallways ending with a locked door. A wave of panic rose in her throat. Calm down, Julia. She glanced at the faint streetlight pouring through an opening in the heavy window drapes. Only a few hours before, she had been strolling about the room, reading aloud to entertain the ever-changing parade of tourists pressed against the velvet ropes. Obviously, it took more than matching initials and a Regency costume to grant a twenty-something-year-old artist the common sense of one of history’s wittiest women. A thought which gave Julia little comfort as she gathered her skirts, shivering against the cool atmosphere. That slight sense of panic returned as she felt her way through the darkness, hastily turning the knob that led from the Steventon House drawing room to the main hallway. Locked inside a dark and creaky nineteenth-century home. Now, that was an adventure to inspire a future painting series, perhaps. Or inspire a prayer breathed under her breath for heavenly protection. Her costume for the community re-enactment thankfully included a velvet bonnet and a heavy winter cloak for covering her empire-waist gown. She pulled the cloak more closely around herself in the gloomy hall. A faint chiming sounded as the old grandfather clock in the main corridor marked one a.m., way past Delaford’s business hours and Julia’s own self-imposed bedtime for rising at seven-thirty in order to be her at “real” job at the Starry Night Bistro. She drew back the bolt on the main door and turned the lock on the knob below, shoving the door open to let in the cold night outside. She tucked the copy of Northanger Abbey beneath the cloak to protect it from the damp atmosphere. On loan from one of her local artist friends, the rare first edition lent an authentic touch to her literary persona. Even though this particular novel was published at least a year after the real Austen’s death, making it unlikely she ever perused a copy in her own sitting room. The cool wind ruffled Julia’s curled hair beneath her bonnet, as she pulled the door shut firmly, listening to make sure the newly-turned lock caught. She crossed her fingers that it would be safe enough until tomorrow’s volunteers arrived. She gathered her skirts, hurried down the steps, and towards home. The other downtown buildings and shops were illuminated by old-fashioned street lamps, the posts already festooned in holly boughs and red ribbons for the Christmas season. Paper snowflakes and stars dangled from business awnings, while an impressive, hand-carved wooden nativity served as the town square’s centerpiece. Her rented house was only five minutes away, but she would reach it faster if she cut across Delaford Park. Wrapping her costume closely around her, she stepped over the low fence line and waded through the thin layer of snow towards the main path. The city park seemed a little less welcoming in the after-dark hours. Dear Lord, please don’t let any muggers be lying in wait, she prayed, her pulse quickening with the pace of the winter breeze. Slipping beneath the sprawling branches of an old sycamore, Julia hopped over the snowdrift onto the main path. She gasped as a tall, masculine figure appeared head-on in the gloom, his features obscured by the shadows as his body collided with hers. “Excuse me.” An apologetic male voice said as a hand reached out to steady her. But she was already past him, casting a fleeting glance over her shoulder as she hurried along. Her heart slammed against her chest as she breathed. Just keep walking. Her ears caught the sound of his voice again, but the words were lost on the wind. Should she have stopped? Going on was rude, perhaps, but her nerves shrank from facing a stranger in such a lonely spot. Not to mention explaining why she was roaming the streets of twenty-first century Delaford dressed like a character from Pride and Prejudice. She crossed the avenue to the residential section. No footsteps echoed behind her, just the crunch of frost beneath her shoes. She slowed her brisk pace only when she turned in the gate for the sage green house with bay windows and peeling paint. Shoving the key into the lock, Julia glanced at the street behind. No figure loomed in the shadows. Silly—letting your imagination run away with you. Almost as bad as Austen’s naïve little Catherine Morland. Catherine was the impressionable young heroine in the book Julia had been reading all afternoon, and no doubt the cause of her overreaction to the night’s adventure. As she slumped against the door, she almost giggled at the nature of her predicament. A woman traipsing through a park in a floor-length frock at one in the morning. Probably the stranger she encountered was far more startled by the experience than she had been. With an amused smile tugging her lips, Julia unfastened the ribbons below her chin and tossed the bonnet onto her sofa. Eliot Weston peered into the sea of blackness, where the strange young woman vanished moments before. Pale white light from the nearest street light had allowed a glimpse of dark curls, full lashes, and rich hazel eyes. And something else rather unexpected—a long, sweeping Regency style gown and cloak straight from the pages of classic English literature. “You need to get some sleep,” he murmured, as he searched the darkened landscape for signs of the mystery girl, who seemed to have vanished in the gloom. Not even a flutter of yellow skirts or bonnet ribbons in the fog. Maybe putting in late nights as the book historian at Delaford University was taking its toll at last. His ‘little sis’ Isabella liked to tease he would end up becoming as musty and forgotten as the books he kept piled inside his office. But he couldn’t help that inspiration struck at odd hours, keeping him at work long past the other faculty members, his fingers flying across the computer keyboard, formulating notes for his upcoming lecture on feminine roles in Gothic literature. He claimed it was only by God’s protection that he hadn’t wandered into an accident on one of his late-night walks. But until now, God had never let him encounter anything so interesting as the striking vision of the lady on this path. Maybe tonight’s experience proved a point about his poor sleep habits. Because there was no way he really saw a woman dressed like Jane Austen strolling through the grounds of Delaford Park. Right? With one final glance, he turned back in the direction of his original destination: the parking lot near the Starry Night Bistro, where his car still sat parked from dinnertime. Eliot preferred walking to driving, since the exercise helped trigger the creative processes. The downside being he often forgot just where he left his car, resulting in more than his fair share of towing fees. Smack! His foot kicked something hard and flat as he passed beneath the old sycamore tree whose shadow had obscured the woman’s shape in the dark. Reaching down, he grasped a small, leather object. Definitely a book, from the shape and feel of it. Carrying it to the nearest lamp post, he turned it over to examine an elaborate binding in the faint glow. Crushed morocco, gilt edging, and a floral centerpiece combined to create a stunning effect. Without looking at the publication date, he guessed it to be antiquated, possibly from the 1800’s. But he didn’t expect the information he found on the title page. Northanger Abbey. Jane Austen’s first full-length novel, published posthumously. “This is crazy.” Eliot stared at the Austen title, dazed by the coincidence. Barring time travel—or a runaway imagination—no other explanations leaped readily to his sleepy brain for the presence of the antique volume in the snowy park. Tucking the book beneath his arm, he glanced around the empty town square, wishing in vain that the beautiful heroine would return and claim her property.